The first version, which is in front of the council for final approval, would clarify the existing language of the ordinance regulating the DDA’s TIF capture in a way that would disallow the DDA’s preferred interpretation of a restriction on TIF revenue. The restriction that’s already expressed in the ordinance language is defined by reference to the amount of growth in taxable value in the DDA district that’s anticipated in the DDA’s TIF plan – a foundational document of the DDA. When those restrictions are applied to the DDA’s TIF revenue, then the amount of TIF received by the DDA would be roughly $4 million in FY 2015. By way of comparison, in the current fiscal year (FY 2014), under its preferred interpretation, the DDA looks to capture approximately $4.5 million of the taxes levied by other jurisdictions. While the council’s Nov. 7 meeting follows the Nov. 5 city council elections, the Nov. 18 meeting is the first meeting of the newly constituted council. There will be only one new councilmember – Jack Eaton, who defeated incumbent Marcia Higgins in the August Ward 4 Democratic primary. The Nov. 7 resolution is sponsored by mayor John Hieftje and Stephen Kunselman (Ward 3). A subcommittee of the park advisory commission (PAC) has been meeting since early 2013 to explore the possibilities for a new downtown park. The subcommittee delivered its recommendations at the Oct. 15, 2013 meeting of PAC. [.pdf of 21-page full subcommittee report] On Nov. 7, the city council will be asked to formally accept the subcommittee’s report. Ingrid Ault chaired the subcommittee, which also included Julie Grand, Alan Jackson and Karen Levin. 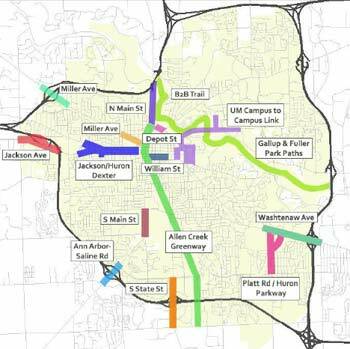 The subcommittee’s work is also meant to supplement the Ann Arbor Downtown Development Authority’s Connecting William Street project. The planning commission had given approval to changes in its bylaws at its July 16, 2013 meeting. Those changes related to the order of agenda items, and the length of time required for special accommodations, such as sign language interpreters. [.pdf of planning commission bylaws on Nov. 7 city council agenda]. The design review board has not had bylaws up to now. 6:50 p.m. Pre-meeting activity. The scheduled meeting start is 7 p.m. Most evenings the actual starting time is between 7:10 p.m. and 7:15 p.m. Several people are here in support of the ordinance revision to waive fees for park usage if the purpose is to distribute goods to address basic human needs. 6:55 p.m. Fox 2 News is here to cover homelessness issues. 6:58 p.m. Based on overheard conversation, Tom Wall is reportedly going to address the council in his cape and tights as Captain Driver Ed. 7:02 p.m. Councilmembers are signing cards for Marcia Higgins (Ward 4). Sabra Briere (Ward 1) is here. She’d called in sick to the planning commission meeting last night. Most councilmembers are now here, but we seem to be a few minutes away from starting the meeting. 7:04 p.m. Confirmed sighting of Tom Wall as Captain Driver Ed. He’ll be addressing the city council during public commentary reserved time about pedestrian safety. He has a guitar with him. 7:09 p.m. Marcia Higgins has just arrived. And we’re off. 7:10 p.m. Pledge of allegiance, moment of silence and the roll call of council. All councilmembers are present and correct. 7:12 p.m. Approval of agenda. Margie Teall (Ward 4) wants to move coordinated funding (DS-19) to after the consent agenda. That appears amenable to everyone. Chuck Warpehoski (Ward 5) wants to move B-1 (DDA ordinance) after C-2 (DDA ordinance – joint subcommittee version). 7:14 p.m. Communications from city administrator. City administrator Steve Powers thanks the Ann Arbor police department for their work in arresting three suspects in Paul DeWolf homicide. He also says that the Main Street lightpoles have been inspected and that he’ll bring a proposal to the council at their Nov. 18 meeting. Six people are signed up to talk about the ordinance change that would waive the park permitting fee for distribution of goods to address basic human needs: Timothy W. Green, Ray Gholston, Stephan Pate, Ryan Sample, Andrew Mutschler, and Raytheon Jones as well as an alternate speaker, Chris Mckeown. Ingrid Ault is signed up to speak on the resolution accepting the park advisory commission’s downtown parks report. And two people are signed up to talk about the resolution establishing a pedestrian safety task force – Tom Wall and Kathy Griswold. Dina Kurz is signed up to talk about the Y lot sale. The second alternate speaker is Emily Tondreau, who’s signed up to talk about the evictions of homeless people from their camp sites and the capacity of the shelter. 7:16 p.m. Timothy W. Green introduces himself as a member of Camp Take Notice. He’s been a part of the demonstration in front of city hall on behalf of the homeless community. In response to the count of 165 homeless people, he contends there’s at least triple that number. If you find yourself in a camp, it’s not safe, because AAPD tells you they have to go, he says. If you’re being run off, he asks, where do you go? You pack up and walk around the streets all night, he says. He took the podium to applause and his remarks conclude with applause. He refers to the amount spent on the Dreiseitl fountain next to their protests. 7:18 p.m. Ingrid Ault is addressing the council on behalf of the park advisory commission. She’s chair of that group and was chair of the subcommittee on downtown parks. She describes how the committee met several times over several months. She describes the survey the committee conducted that received over 1,600 responses. She highlights the eight recommendations in the committee’s report. 7:23 p.m. Ray Gholston invites everyone to stand who supports more support for homeless people. Almost everyone in the middle section of the chambers is standing in support. The way Ann Arbor treats the homeless is a human rights violation, he says. He says that if there were a pack of dogs out on Huron Street, people would go make sure they had shelter, but Ann Arborites won’t do the same for the homeless. There’s not enough space in the shelter, he says. 7:27 p.m. Stephan Pate introduces himself as a member of the homeless community. AAPD are running people off of property without giving them enough time to gather up their belongings, he says. He asks for enough time to gather up their belongings and live in peace. Griswold is essentially arguing for the expansion of the existing committee, which includes representatives of the University of Michigan, the Center for Independent Living and the Washtenaw Biking and Walking Coalition. Griswold thanks Warpehoski and Briere for their work to bring forward the task force resolution. The TSC was established in 1969, she says. She was a consultant for the TSC back in 2001, she says. It’s time to reassess the situation. She describes legislation in Lansing in the works that would make the Uniform Traffic Code the state law. 7:31 p.m. Andrew Mutschler introduces himself as a member of the Camp Misfit homeless community who are protesting out in front of city hall. He describes how he’d come back to his encampment to find all his belongings gone. He emphasizes that everyone needs stability, a place to call home – even if it’s just a 6×6 roof over your head. 7:34 p.m. Tom Wall is addressing the council as Captain Driver Ed. His son wasn’t allowed to introduce him on account of the speaking rules. He offers to the city, once they’ve decided what to do, his driver ed school, saying it’s very good at education. He’s now singing “Captain Driver Ed, Captain Driver Ed …” People are sort of singing along. “Don’t get distracted, it’s not attractive.” He tells people to clap for him. They do. 7:37 p.m. Raytheon Jones is speaking on behalf of the homeless. It’s a serious problem, he says. “Many of us are troubled, with nowhere to go,” he says. He’s speaking for the disenfranchised, the poor, the homeless and the people who have no voice. He first arrived in Ann Arbor in July a few months ago. He was sitting in a park, not being boisterous, he said. But AAPD had called him over and asked him what he was doing. They’d told him there were people there with their families and he needed to find somewhere else to go. There was no room in the shelter, he said. The homeless need somewhere to go, he says. 7:37 p.m. Council communications. This is the first of three slots on the agenda for council communications. It’s a time when councilmembers can report out from boards, commissions and task forces on which they serve. They can also alert their colleagues to proposals they might be bringing forward in the near future. 7:40 p.m. Briere is talking about the parking situation at Argo Cascades. The result of the city’s work was to put parking at Longshore Park. The neighborhood was not impressed with that, she says, and it had stopped after one weekend. On Nov. 21, at 7 p.m. the city is holding a public meeting on the parking needs at the Ann Arbor District Library’s Traverwood branch. 7:42 p.m. Sally Petersen (Ward 2) responds to the public commentary. She asks if the city administrator can contact the churches that provide a rotating shelter to see if that can be started earlier this year. Mayor John Hieftje says that it’s handled through the Shelter Association center. The warming center will open on Nov. 18, Hieftje says. He’d been in communication with the Shelter Association. 7:44 p.m. Jane Lumm (Ward 2) acknowledges that four AAPD officers were honored as officers of the year by the Washtenaw 100 Club. Oct. 24 was the date of this year’s event, she says. She lists off the names of the four officers. They’d entered a burning building and saved woman’s life on Jan. 13, 2013, she reports. 7:48 p.m. Chuck Warpehoski (Ward 5) also responds to the public commentary. He points out that there are not only churches but also synagogues. What triggers an eviction? he asks. City administrator Steve Powers says that by ordinance, camping is not allowed in city parks. Warpehoski confirms that it’s complaint driven. Powers also indicates there’s a 48-hour orange notice that’s posted saying: Please move. Powers indicates that he’s discussing the issue with the members of Camp Misfit and with Chief Seto. Warpehoski says we don’t solve the problem of homelessness just by moving people around. He calls for upholding our laws with maximum humanity. He’s concerned about people’s belongings being respected. 7:49 p.m. Mike Anglin (Ward 5) gives an update on the Safety on Seventh campaign. There’ll be a community meeting on possibly more traffic calming. He’s disappointed that two elementary schools have discontinued their walk-to-school programs. He wonders if Bach and Eberwhite ended their program because of the traffic on Seventh Street. 7:51 p.m. Margie Teall (Ward 4) says she wants to change the tone. She recognizes that it’s the last meeting for Marcia Higgins (Ward 4). Higgins is presented with a crown, which she puts on. She indicates she’ll be wearing it for the duration of the meeting. 7:53 p.m. Nominations. Nominations tonight include Peter Greenfield to the airport advisory council replacing Wilson Tanner, and Anthony Ramirez to be re-appointed to the cable communications commission. On the housing and human services board, Eleanor Pollack and Thaddeus Jabzanka are being nominated to fill the vacancies left by Ned Staebler and Anthony Ramirez, respectively. Mohammad Issa and Linda Winkler are being nominated for re-appointment to the city’s human rights commission. On the Ann Arbor housing commission, Christopher Geer is being re-appointed to correct the end date of his term. On Jan. 7, 2013 the council confirmed his appointment for a term ending May 5, 2014. Tonight’s confirmation, which is taking place in one step and needs eight votes to be approved, corrects the end date of his term to May 1, 2017. 7:54 p.m. Outcome: The council has voted to approve Geer’s re-appointment to the Ann Arbor housing commission. 7:54 p.m. Appointments. The council is being asked tonight to confirm appointments for nominations that were made at the council’s previous meeting on Oct. 21. Nominated to fill the remaining vacancy on the Ann Arbor Downtown Development Authority board – due to the resignation of Nader Nassif – was Cyndi Clark, owner of Lily Grace. The business is described on its website as a luxury cosmetics boutique in downtown Ann Arbor. A replacement for Julie Grand on the park advisory commission was nominated at the Oct. 21 meeting – David Santacroce. He’s a professor of law at the University of Michigan, and he chaired the North Main Huron River corridor task force, which worked for a year and delivered its report recently to the council on recommendations to the corridor. Grand attended her last meeting of PAC on Oct. 15, 2013, after completing the maximum two terms of service. Amy Shepherd was nominated to serve on the city’s commission on disability issues. Shepherd is president of the Michigan Parents of Children with Visual Impairments. On the energy commission, Shoshannah Lenski was nominated to replace Mike Delaney, and Mike Shriberg was nominated for reappointment. 7:56 p.m. Hieftje describes Colenback’s credentials as assistant dean at the UM school of social work. Hieftje describes Cyndi Clark as having expertise in retail, in the cosmetics industry, on an international level. Hieftje also praises Santacroce’s work leading the North Main Huron River corridor task force. 7:58 p.m. Stephen Kunselman (Ward 3) highlights the energy commission appointment of Shoshannah Lenski, who works with DTE. Kunselman points out there are some issues with the timely repair of streetlights, citing some near Mary Beth Doyle Park that have been out for quite a while. 7:58 p.m. Outcome: The council has voted to approve all the appointments. 8:01 p.m. Hieftje is now talking about the various services that the city of Ann Arbor offers for the homeless community. He recalls running for city council at the time when the building of the Delonis Center was being debated. [The shelter is located at 312 W. Huron, near the downtown.] He reiterates that the warming center is opening on Nov. 18. Hieftje describes how sometimes the AAPD posts notices and after the 48-hour period they return and they find no on there but possessions left behind. It’s something the AAPD is working on, he says. 8:03 p.m. Briere says the opening of the warming center is happening on about the same schedule as in the past. It’s not unusually late, she says. She asks Hieftje if the council will be asked for financial support for the warming shelter. She ventures that because she and Lumm serve on HHSB, they’d have occasion to meet with city and county staff and other nonprofits so that if there’s a need for funding, it can be brought back on Nov. 18. 8:03 p.m. Public hearings. All the public hearings are grouped together during this section of the meeting. Action on the related items comes later in the meeting. Two public hearings are scheduled: (1) The council is being asked to adopt an update to the city’s non-motorized transportation plan, which is part of the city’s master plan. The planning commission adopted the plan at its Sept. 10, 2013 meeting. [.pdf of draft 2013 non-motorized transportation plan update]; (2) a site plan for the expansion of the Ann Arbor Christian Reformed Church at 1717 Broadway St. The city planning commission recommended approval of the project at its Oct. 1, 2013 meeting. 8:04 p.m. PH-1 Adopt 2013 update to non-motorized plan. Kathy Griswold says it’s an exciting night because there’s more than one item on the agenda involving pedestrian safety. She urges the council to not adopt the update to the plan. It fails to identify funding for all the improvements. 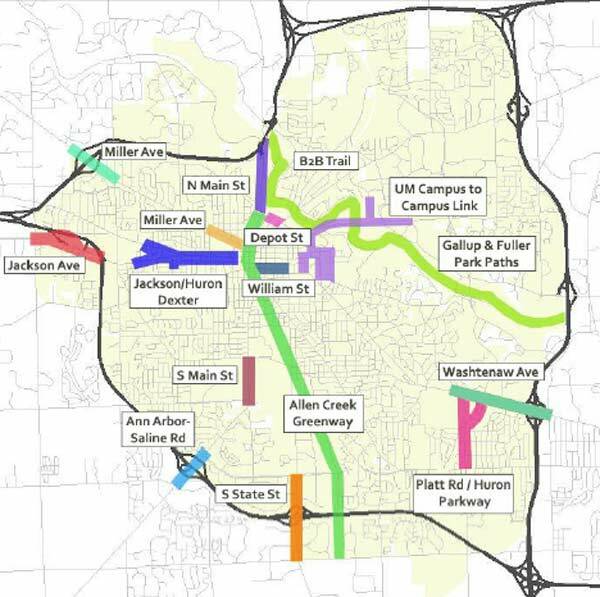 The plan alludes to funding improvements with federal Safe Routes to Schools funding and she is “absolutely disgusted” by it because Ann Arbor can afford to fund that itself without tapping federal funds. 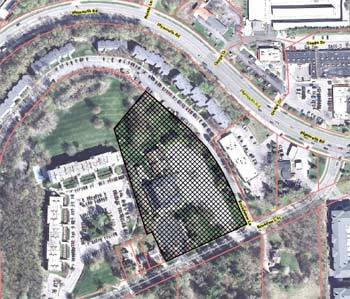 8:06 p.m. PH-2 Site Plan: Ann Arbor Christian Reformed Church at 1717 Broadway St. No one speaks at this public hearing. 8:06 p.m. Approval of minutes for previous meeting. 8:07 p.m. Outcome: The council has voted to approve the minutes from the previous meeting. 8:07 p.m. Councilmembers can opt to select out any items for separate consideration. Briere wants to pull out CA-2, the planning commission bylaws. Briere says that the planning commission is discussing an additional change to the bylaws, so she wants to postpone until Dec. 16. 8:09 p.m. Outcome: The council has voted to approve all the consent agenda items, except for the planning commission bylaws, which have been postponed until the second meeting in December. 8:15 p.m. OCED director Mary Jo Callan is fielding questions from Teall and Lumm. 8:17 p.m. Callan stresses that there’s no “pooling of funds” and that each entity maintains control over the designation of its own funding. 8:18 p.m. Warpehoski asks how the model doesn’t just cherry-pick the easy-to-serve kids and leave out the hardest-to-serve. Callan notes that the targeted population are selected by “let’s start with the poorest folks first.” The funds are in fact for the hardest-to-serve kids, she says. 8:19 p.m. Callan is talking about the best evidence-based practices and that’s what will be funded. 8:20 p.m. Outcome: The council has voted to authorize the coordinated funding process. 8:21 p.m. Kunselman asks that it be tabled. That puts it off to a date uncertain. It could be brought back as an option. 8:21 p.m. Kunselman describes how he’s planning to go talk to the other taxing jurisdictions about the council’s efforts. So he moves to table. 8:24 p.m. Teall says “I don’t get it,” saying that it’s been postponed several times. If the alternative proposal from the committee were to pass (the next agenda items) she wants to know what would happen. Kunselman explains the difference between the versions. This current version says that any changes to the restriction would need the approval of the other taxing jurisdictions. So Kunselman wants to discuss the second version with the other governmental entities. 8:24 p.m. Teall wants to know what would cause Kunselman to bring back the first version off the table. “Hopefully nothing,” he says. 8:25 p.m. Kunselman says that he hopes there will be no complaints and no whining. 8:25 p.m. Outcome: The council has voted unanimously to table the DDA ordinance change. 8:27 p.m. Taylor is introducing the resolution. He recalls the Pizza in the Park issue in Liberty Plaza downtown. This extends the scope to all parks, not just downtown. Taylor notes that the proposal has been vetted by the park advisory commission. 8:28 p.m. Teall thanks Taylor for meeting with her and the representatives of Camp Take Notice and “taking the ball and running with it.” She thanks the CTN people. She encourages everyone to vote for it. 8:28 p.m. Outcome: The council has voted unanimously to give initial approval to the ordinance change that would allow for distribution of humanitarian aid in city parks without incurring a fee. 8:31 p.m. Kunselman describes the alternative as much “cleaner” and it addresses just the TIF capture. Key stat: The TIF cap would have a basis $224 million taxable value in tax year 2016 with an increase of 3.5%. 8:32 p.m. Kunselman describes the amount of the DDA’s TIF capture as capped at around $6 million for the 2016 tax year. He invites CFO Tom Crawford to the podium. 8:34 p.m. By 2033 there would be “millions and millions” of dollars going back to the taxing authorities, says Kunselman. Crawford says he’d project that within a few years after the cap, more than $1 million would be distributed to the other governmental units. 8:35 p.m. Crawford is now describing the bonding capacity that the cap would allow: $59 million for the next 10 years. If they chose not to bond, the capacity for projects would be smaller. 8:37 p.m. Kunselman says he’ll have a couple of amendments. The point is not to hamstring the ability of the DDA to undertake capital improvements, Kunselman says. Part of the point is to improve the ability of the DDA to budget. 8:40 p.m. Kailasapathy notes that there’s two variables in the TIF plan: escalator and the basis. Crawford has chosen 3.5% which is from the TIF plan to avoid changing the TIF plan. Crawford concedes that the basis for the taxable valuable in the committee’s proposal is not from the TIF plan. Kailasapathy concludes that this is a change to the TIF plan. Crawford says there’s room for differing views on this. 8:41 p.m. Lumm asks about the clause in the existing ordinance that says that the restrictions in the ordinance can’t be removed except by approval of the other governmental units. 8:42 p.m. Assistant city attorney Mary Fales says it’s not possible for the city to abdicate its fiduciary responsibility to another entity. 8:48 p.m. Kunselman forwards an amendment by email to his colleagues about affordable housing. 8:48 p.m. Kunselman notes that the council had revised the DDA’s budget earlier in the year to transfer $300,000 of TIF to the DDA’s housing fund. He moves that the DDA be required to budget $200,000 for the DDA housing fund, starting in 2014, adjusted at the same rate of increase as the TIF income – to be spent on projects that meet the income guidelines of the Ann Arbor housing commission. Kailasapathy wants the amount to be $300,000. Kunselman agrees. Briere notes that generally there’s an implied expectation that the city would match whatever the DDA does. She wants that on the record. Taylor asks if the proposal is enforceable. Fales says the council has the ability to approve the budget. 8:49 p.m. Briere wants to know if 2014 is tax year, calendar year, or fiscal year. Kunselman says it should be 2016 anyway. 8:54 p.m. Hieftje says he doesn’t think the DDA objects to funding affordable housing. But the DDA’s suspension of transfers to its housing fund was a function of having the obligations of building the underground parking structure, he says. 8:57 p.m. Executive director of the DDA Susan Pollay is fielding questions from the council. Warpehoski says he likes the idea of making sure the DDA’s housing fund is actually an affordable housing fund. But he’s not sure that Kunselman’s approach is right. Kunselman suggests that the requirement for projects to meet the Ann Arbor housing commission’s standards could be tied only to the $300,000 in the ordinance. Warpehoski asks if the HHSAB can simply exercise oversight. Kunselman doesn’t think HHSAB has enough teeth as an advisory body. 9:00 p.m. Kunselman now is amending his own amendment to restrict just the funds mandated by the ordinance to be in support of housing projects that meet the Ann Arbor housing commission’s income standards. Hieftje thinks there needs to be more flexibility. Kunselman amends to cite 50% AMI (area median income) as the standard. 9:03 p.m. Outcome: The council has unanimously approved Kunselman’s amendment. 9:09 p.m. Kunselman is putting forth another amendment involving the capital improvement plan (CIP). This is an amendment from the first version of the ordinance that had received initial approval. Responding to Warpehoski’s question, city administrator Steve Powers says that the amendment would not pose a problem. Briere reviews how the CIP is put together. 9:10 p.m. Outcome: The council has unanimously approved Kunselman’s amendment on the CIP. 9:10 p.m. Lumm is proposing an amendment to add term limits. This is language from the first version. 9:14 p.m. Petersen notes that the bylaws approved by the council that night for the design review board also include term limits. She counters the argument that you lose someone’s expertise if term limits are imposed by saying that you don’t lose their expertise because that can be tapped on an informal basis. 9:15 p.m. Kailasapathy likes the portion of the amendment that restricts elected officials from serving on the DDA board. 9:21 p.m. Briere says that she’s not impressed with the value of term limits for elected officials. She says she might be willing to consider a limit of three consecutive terms instead of two. She argues for that by saying that the planning cycle for DDA projects is 10 years. She doesn’t like the part that says that elected officials of other jurisdictions can’t serve on the DDA board. She opposes term limits on a philosophical basis. Kunselman replies by saying, “Oh my, look what I’ve started!” He had wanted to leave the governance issues aside because they can be addressed at any time. As far as the mayor’s appointment to the board, Kunselman says that the council could simply choose to appoint the city administrator instead of the mayor, when the council makes its annual committee appointments. 9:22 p.m. Kunselman doesn’t have a problem with elected officials from other jurisdictions serving on the DDA board but wants them all represented – the Ann Arbor Area Transportation Authority, the Ann Arbor District Library, and Washtenaw County. He doesn’t have a problem with term limits. 9:26 p.m. Teall asks how the joint committee had felt about term limits. Lumm says she missed the last joint committee meeting but she’d said at an earlier meeting that she’d wanted the term limits included. Kunselman says his focus had been on the financial picture. He stresses that there be consensus with the body that is being regulated so that they don’t feel “beaten down.” He didn’t want the discussion to be bogged down about feelings. The discussion had been going on for quite some time. “I’m tired of it, and the community is tired of it,” Kunselman says. 9:28 p.m. Teall won’t support the governance amendments including term limits. She wants it to pass with a large majority. Hieftje says he won’t be mayor after 2014. He wants to wait and see if the state legislature takes action requiring the representation of the other governmental units on the DDA board. Term limits have been a disaster with the Michigan legislature, Hieftje says. There is adequate turnover as it is, he says. He won’t support term limits. 9:31 p.m. Kailasapathy offers an amendment that would require representation of all the jurisdictions on the DDA board. Petersen echoes Hieftje’s sentiments, saying that the state legislature may act. Hieftje says the state legislature might act in a way that would allow the addition of representatives from other jurisdictions more swiftly. Discussion of different amendments to amendments. Hieftje calls for a recess to sort it all out. 9:34 p.m. Recess. We’re in recess. 9:48 p.m. And we’re back. 9:52 p.m. Lumm is amending her amendment. It would be effective for the first appointment to the board after the date of the ordinance’s enactment. It’s constrained to term limits. 9:55 p.m. Kailasapathy says there’s a difference between the Michigan legislature and an appointed body. She says that for elected officials, she doesn’t see the need for term limits. But for appointed boards, the more you get people involved, the more vibrant it becomes and the more perspectives it brings in. Look at the DDA board, she says: Do you want to keep this or do you want more diversity, she asks. Hieftje says that he can’t recall that a person of color has applied to the DDA. He points to the fact that there are four DDA board members who are in their first terms. He says he’s gone away from nominating developers and has selected representatives from small businesses to serve on the board. He says there is diversity of viewpoint on the DDA board. 9:57 p.m. Lumm says, “You can Google it” to find that term limits are a nonprofit board best practice. It’s a healthy thing. She argues there should be consistency on all the boards and commissions. She argues that opportunities should be opened up for others to serve. 10:00 p.m. Lumm says it’s not difficult to recruit people to serve on the DDA board. Warpehoski says on the broader issue of whether term limits are good or bad, he can find examples of each. Given the small size of the DDA staff, he’s concerned about the preservation of the DDA’s institutional memory. He’d voted to put Russ Collins on the DDA board for a third term, so by the argument of consistency he couldn’t support this amendment. But he rejects the idea of consistency as the main consideration. 10:03 p.m. Kunselman argues that turnover is good when money is at stake. He thinks that two four-year terms is more than most councilmembers serve. As far as his vote for Russ Collins for a third term, he says he likes Russ and used to work for him at the Michigan Theater. But he wouldn’t vote for him again. It’s a core group of people who seem to hang around, he says. He points out that the city charter imposes term limits on certain kinds of boards and commissions. If it’s that big of an issue, a future council can bring it back, Kunselman says. 10:05 p.m. Hieftje proposes a compromise of a limit to three terms, not two. 10:05 p.m. Lumm says “That’s not the kind of revitalization I was looking for.” She says she’ll continue to work on the issue for all boards and commissions, but for tonight she’ll go along with three terms as the limit. 10:07 p.m. Briere challenges Petersen’s assertion that the bylaws of the design review board and the planning commission contain term limits. Higgins says she’d have supported the two-term limit, but will support three. She laments the disparagement of members of a sitting board, some of whom are sitting in the audience. Talking about a changeover and alluding to a “core group” of people is hurtful, Higgins says. That discourages people from stepping forward to serve. 10:08 p.m. Petersen thanks Briere for the correction on the bylaws, and apologizes to Taylor. Hieftje wants to move it along to a vote. 10:08 p.m. Outcome: The council has voted to approve the three-term limit. Teall and Taylor dissent. 10:09 p.m. Warpehoski asks for clarification of the TIF cap. It grows by 3.5%, is the explanation. 10:13 p.m. Taylor says that even though the stated intention is not to harm the DDA, the buying power of the DDA would be reduced by half over the next 10 years. That’s an incredible harm to the downtown, Taylor says. Only half of the excess would come to the city of Ann Arbor, he says. Lumm replies that the amount of TIF the DDA would receive would grow “handsomely” over the next few years. 10:13 p.m. Lumm says that she appreciates the work that has been done on this. She laments the fact that the discussion had become a litmus test of whether someone supports the DDA. 10:13 p.m. Lumm says Higgins was wise to create the joint DDA council committee. 10:16 p.m. To be clear, the council is now discussing the main motion. Hieftje says he is glad that the previous version was not pursued. Hieftje says that if the city is going to survive under Michigan’s funding system, it needs growth. Ann Arbor is fortunate to have UM as a job magnate. The park system attracts people, he says. AAPS also has high quality schools. The vibrant downtown is also an attractant. The DDA is a prime factor for success, says Hieftje. 10:19 p.m. Kailasapathy asks Crawford about the Justice Center bond repayment schedule. She’s referring to the $8 million mentioned in the DDA’s 2008 resolution that goes to the bond repayment. Crawford gives an explanation in terms of the “present value of money.” She points out that the DDA ends in 2033, which goes five years past the end of the DDA’s TIF plan. 10:20 p.m. Kunselman thanks the DDA board members for going through this with him. He makes further conciliatory remarks. 10:21 p.m. Outcome: The council has voted to give initial approval to the DDA ordinance revision. 10:21 p.m. DC-1 Digital billboard on E. Stadium Blvd. At the council’s Oct. 21 meeting, Christopher Taylor (Ward 3) announced the intent to bring forward the resolution, which requests that the University of Michigan decommission the $2.8 million digital billboard that it’s constructed on E. Stadium Blvd. The city’s fallback position is a request that the university operate the billboard (marquee) only around the time of major events at the football stadium or the Crisler Center. The resolution cites the city’s own recently enacted sign ordinance, which constrains the deployment of digital technology for outdoor signs. 10:26 p.m. Hieftje asks that the council not spend a whole lot of time on this. [UM head of community relations Jim Kosteva is in the audience.] Taylor reads aloud some remarks. Teall thanks Taylor for putting it all together. She’d heard comments that the city shouldn’t be bothered because the sign is across from the golf course. She points out that it does face the drivers. 10:32 p.m. Higgins says in the interest of sustainability, it doesn’t make sense to have the sign lit at midnight. 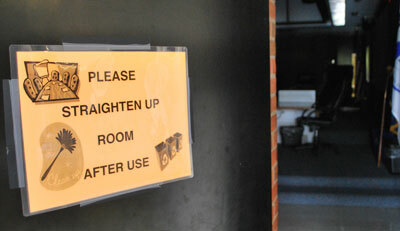 Kunselman wonders if anyone asked a UM regent about the issue when the marquee was in the planning stages. Kunselman says that he doesn’t want to have the university and the city “lobbing” resolutions back and forth. He doesn’t want to get a resolution from the regents saying, Why don’t you pave the road in front of the stadium? 10:33 p.m. Teall blames the university for not reaching out to the city. Kunselman asks Kosteva why the city wasn’t informed. Kosteva responds by saying his intent was to be present, to be a listener and to take the council’s concerns back to the university. 10:36 p.m. Lumm thanks Kosteva for being there. She’s reading aloud a statement. 10:38 p.m. Anglin says it’s the same drivers who go past it, so he questions what effect it has. 10:41 p.m. Taylor counters Kunselman’s contention that the resolution is heavy-handed, saying that it was open and temperate communication. Petersen wonders if the UM would consider showing public service announcements from the city on the marquee. 10:41 p.m. Outcome: The council has voted unanimously to approve the resolution requesting the University of Michigan decommission its $2.8 million billboard. 10:42 p.m. Taylor is introducing the resolution. 10:43 p.m. Outcome: The council has voted over dissent from Mike Anglin (Ward 5) to accept the report on downtown parks. 10:43 p.m. DC-3 Ethics resolution The resolution does not include “ethics” in the title, but addresses the kind of issues that could be described under the general rubric of “ethics.” The resolution directs an educational effort on Public Act 317 of 1968, which is the state’s conflict-of-interest statute. A final “resolved” clause direct the council’s rules committee to draft standards of conduct for local officials based on Public Act 196 of 1973, which applies to state employees of the executive branch and appointees of the governor. The final resolved clause – if it’s approved, and if the council adopts a standard that’s recommended by the council rules committee and it’s strictly followed – would end any unauthorized leaks of information from the city government. 10:43 p.m. Petersen, who is the sponsor of the resolution, asks for postponement. 10:44 p.m. Outcome: The council has voted to postpone direction for education on professional standards and tasking the rules committee with drafting standards of conduct. 10:53 p.m. Briere is introducing the resolution. She responds to Griswold’s suggestion during public commentary that the AAPS transportation safety committee be adapted to this purpose. But Briere notes that the TSC is not a city committee. Briere gives the rationale for the creation of the committee. Warpehoski explains that there’s been a lot of interest in participation but the size of the task force was intended to provide focus and to allow the group to operate efficiently. Powers says that the task force won’t staff itself and would depend on any budget the council might approve. A budget is not a part of tonight’s resolution. Briere says she’s received positive communication from the University of Michigan about participation, and thinks that some of the cost could be offset by the UM. 10:57 p.m. Kunselman wonders if the timeline isn’t too aggressive. He questions if it’s realistic. Kunselman ticks through some of the items in the cost analysis, and wonders if it really would be $100,000. Kunselman asks where the funding would come from. Public services area administrator Craig Hupy confirms it would be on the order of $100,000. [.pdf of Nov. 7 memo on pedestrian safety] It would have to come from the general fund. Kunselman questions what the goal of the task force would actually be. Warpehoski says if people want to put it off and take more time, he’s willing to postpone. Kunselman comes back to the point of an aggressive timeline. Staff resources are limited, he says, and there are other issues that might need to be focused on. 11:06 p.m. Kunselman isn’t sure the resolution is really ready. He doesn’t think the work is going to be done by September 2014. It took 8 months just to get a DDA ordinance passed, he notes. Briere argues for the establishment of a task force. Hieftje wonders if Warpehoski and Briere would be amenable to postponement. Briere says she will support that, but wants her colleagues to focus on recruitment of volunteers for the task force. Petersen will support postponement, but wonders if this task force shouldn’t be a standing committee, instead. 11:07 p.m. Outcome: The council has voted unanimously to postpone the creation of the pedestrian safety task force. 11:08 p.m. From the audience, Donald Salberg asks if he could comment. No, says Hieftje. 11:11 p.m. Taylor says he has been concerned all along about the use of the property. He says that the city and the community should understand more clearly what the property would be used for. He says that he’s forwarded an amendment to his colleagues. The resolution would direct how the sales agreement would be structured – with an obligation that a structure be built, and that the building be energy efficient and that the AAATA be involved in the conversation. 11:16 p.m. Taylor is now reading aloud the amendment. There’s a minimum 400% FAR including mixed use on the bottom floor, office space on the mid-floors and residential on the top floors. The uses are essentially those that are described in Dahlmann’s letter. The deadline for building something is January 2018. There’s a prohibition against sale to another third party except that the city has a right of first refusal. 11:17 p.m. Taylor continues with reading aloud the amendments on requirement for energy efficiency and the required conversation with the AAATA. 11:19 p.m. Petersen checks the arithmetic on 400% FAR. She confirms that Taylor is rounding 350% FAR to 400%. Briere contends that D1 requires 400% at a minimum anyway. 11:21 p.m. Teall says she’s concerned about the future use. She thinks that a hotel would be suitable for that parcel. She feels that visitors to the downtown are an economic generator. She appreciates the amendments. 11:25 p.m. Hieftje invites broker Jim Chaconas to the podium. He compliments Chaconas on his good work. Hieftje wants to pay off the debt. He doesn’t want to roll the dice and refinance. He asks Chaconas if the additional requests might cause Dahlmann or CA Ventures to balk. Chaconas says some of the requests make sense. But he doesn’t want to put too many restrictions on it. Dahlmann is offering a lot of money for the property, he says. Hieftje ventures that there’s an opportunity for negotiation. 11:26 p.m. Lumm says that the resolution is not written like a negotiation. She wants to “pound through” the amendments with Chaconas. 11:28 p.m. On the 400% FAR minimum, Chaconas contends that it’s a part of D1 zoning. 11:31 p.m. Kailasapathy asks Chaconas about the energy efficiency clauses. Briere stresses that Dahlmann would need to seek premiums to build more densely than 400%. Chaconas says that the amendments are items that have mostly been discussed with councilmembers. 11:33 p.m. Warpehoski says that he’s breaking council rules to disseminate Taylor’s amendments to the press. Kunselman thanks Chaconas. Kunselman says use can’t be controlled. What the council wants is a really nice building. He doesn’t think the amendments overload the property with use requirements. 11:36 p.m. Petersen points out that there are other city-owned properties that could be developed – responding to the possibility that the council doesn’t get the use it wants for this parcel. 11:37 p.m. Outcome: The council has voted to approve the resolution, as amended, directing the city administrator to negotiate a sales agreement with Dennis Dahlmann for the sale of the former Y lot in downtown Ann Arbor. 11:37 p.m. DC-6 “Eat the Street” temporary food sales. The council is being asked to grant approval, under Chapter 55 (Zoning), Section 5:10.15(h) of the city code, for temporary sales of food at the vacant property at 1215 South University. The request is being made of the council by the South University Area Association (SUAA), which is planning a special event from Nov. 8, 2013 through Jan. 8, 2014. SUAA wants its “Eat the Street” event to include outdoor food cart sales at the location. 11:38 p.m. Lumm is thanking the South University Area Association and everyone’s hard work. 11:38 p.m. DC-7 Amicus brief on abortion clinic protest buffer zones. This resolution was added to the council’s agenda at around 4 p.m. today. It would list Ann Arbor as a “supporting municipality” in an amicus brief to be filed with the United States Supreme Court in a case to be heard by the court in McCullen v. Attorney General for the Commonwealth of Massachusetts. The plaintiff in that case is challenging a law creating a 35-foot buffer zone around Massachusetts abortion clinics, where people cannot demonstrate. The city of Ann Arbor would be weighing in to support the idea that laws can be enacted establishing buffers around abortion clinics where people cannot demonstrate. Tangentially related to buffer zones for protest, in 1990 Ann Arbor voters agreed to amend the city charter to establish the city as a “zone of reproductive freedom.” From Chapter 20 of the Ann Arbor city charter: “No person within the City of Ann Arbor shall violate any law, rule, or regulation of this state which restricts or prohibits the right of any woman to an abortion, or which restricts or prohibits the right of a person to perform an abortion, as such right existed on January 20, 1981.” The resolution is co-sponsored by Sabra Briere (Ward 1), Christopher Taylor (Ward 3) and Jane Lumm (Ward 2). 11:39 p.m. Taylor invites city attorney Stephen Postema to explain the background. 11:43 p.m. Postema argues for his position based on the need for local authorities to exercise appropriate authority to balance time, place and manner considerations with First Amendment rights. He assures Taylor that it would not be a burden of city attorney resources, saying he merely needs to inform the filers of the amicus brief of the council’s vote. 11:43 p.m. Outcome: The council has voted to approve placing the city of Ann Arbor as a supporting municipality signing on to the amicus brief. 11:44 p.m. Briere asks Hupy to the podium. He defers to transportation program manager Eli Cooper and city planning manager Wendy Rampson. 11:51 p.m. Lumm says that with so many items on the agenda, she hasn’t had time to read through the plan. She wonders if there’s support for postponement. Hieftje allows that Lumm is right about it being an important document. There’s been a tremendous amount of work on the plan, Hieftje says. It’s already been through an extensive process. Surrounding municipalities have reviewed it, and it has been adopted by the planning commission. Hieftje is not inclined to postpone. Kunselman asks if the plan has implications for grant eligibility. Yes, says Cooper. He gives an example of a non-motorized bridge across US-23 that was funded because it was indicated in the city’s non-motorized plan. Anglin says the council has heard a request from Lumm for more time. Lumm now moves for postponement. 11:54 p.m. Hieftje indicates that he’s already expressed his opinion. Briere allows it’s possible to be overloaded during campaign season. But she’s followed the plan in its development and now she’s ready to vote on it. There were no surprises in the update, she says. She feels that there are times when the council postpones beyond what’s reasonable. The item was on the agenda on Thursday. Kunselman says that postponing won’t hurt anything. It won’t cause any problems, he says. Teall says she’s ready to vote. 11:55 p.m. Lumm alludes to the solid waste plan, which the council had decided it needed to amend. 11:57 p.m. Outcome: The council has voted to postpone the update to the non-motorized plan. Voting for postponement were Kailasapathy, Petersen, Lumm, Kunselman, Higgins and Anglin. 11:57 p.m. DB-2 Site plan: Ann Arbor Christian Reformed Church. The council is being asked to approve a site plan for the expansion of the Ann Arbor Christian Reformed Church at 1717 Broadway St. The city planning commission recommended approval of the project at its Oct. 1, 2013 meeting. The site plan proposal calls for tearing down five existing buildings and constructing a 12,850-square-foot, two-story addition to the rear of the church. The addition would be used for educational activities at the church, which is located on a 4.3-acre site in Ward 1, southwest of Broadway’s intersection with Plymouth Road. 11:58 p.m. A representative of the project is giving a description of the project at Briere’s request. 11:58 p.m. Outcome: The council has voted to approve the site plan for Ann Arbor Christian Reformed Church on Broadway. 11:59 p.m. Hieftje is putting the six resolutions before the council all in one go. 11:59 p.m. Outcome: The council has voted unanimously without discussion to approve all of the MDEQ grant requests through the SAW program. 12:00 a.m. Outcome: The council has voted without discussion to approve the contract with Catskill to install the drainage blanket. 12:00 a.m. Outcome: The council has voted unanimously without discussion to approve the MDOT contract. 12:02 a.m. Kunselman reports that there was a good public meeting on the topic. An issue that had arisen was the desire for more streetlights. He says it’s significant that there’s an 80% federal grant supporting the assessed costs. 12:02 a.m. Outcome: The council has voted to direct the design and cost estimates for the Stone School Road sidewalk project. 12:03 a.m. Teall says it’s another very exciting project. She thanks neighborhood resident Peter Houk for his work. 12:04 a.m. Higgins has a question for Craig Hupy. Scio Church Road is coming up for reconstruction, she ventures. Hupy says it’s on the radar but was pretty far off. 12:04 a.m. Outcome: The council has voted to direct preparation of sidewalk design for Scio Church. 12:05 a.m. DS-11 Tech engineering services ($250,000). The council will be asked to approve two different contracts that resulted from a bid that the city put out in June 2013 – for technical engineering services to support the water treatment services unit with capital, operation, and maintenance project support for the water system, dams, and hydroelectric generating stations. One of the contracts is with Stantec Consulting Michigan Inc. ($250,000). The other contract is with Tetra Tech of Michigan ($250,000). First up is Stantec. 12:05 a.m. Outcome: The council has voted to approve the contract with Stantec. 12:05 a.m. DS-12 Tech engineering services ($250,000). This is the second of two contracts related to the same RFP put out by the city. This one goes to Tetra Tech of Michigan. 12:05 a.m. Outcome: The council has voted to approve the contract with Tetra Tech. 12:05 a.m. DS-13 Purchase ozone generator dielectrics ($68,209). The council is being asked to approve a purchase order with Ozonia for ozone generator dielectrics. The city uses ozone in its disinfection process for its drinking water. 12:06 a.m. Outcome: The council has voted to approve the purchase of ozone generator dielectrics. 12:06 a.m. 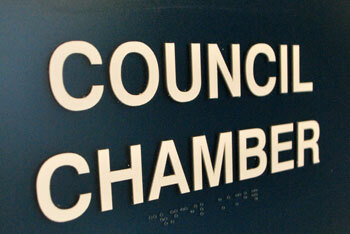 Outcome: The council has voted to accept the domestic violence prevention grant. 12:06 a.m. DS-15 Drug court grant ($144,000). The resolution accepts a Michigan Supreme Court drug court grant for the 15th District Court. The 15th District Court’s sobriety court is “hyper-intensive probation,” which follows sentencing. 12:06 a.m. Outcome: The council has voted to accept the drug court grant. 12:06 a.m. DS-16 Dawn Farm contract ($88,000). The resolution authorizes a contract with Dawn Farm for out-patient drug abuse counseling as part of the 15th District Court’s sobriety court ($88,000). 12:07 a.m. Outcome: The council has voted to authorize the contract with Dawn Farm. 12:07 a.m. DS-17 Veterans court grant ($92,279). The resolution accepts the Michigan Supreme Court veterans treatment court program grant. 12:07 a.m. Outcome: The council has voted to accept the veterans court grant. 12:07 a.m. DS-18 SafeHouse Center contract ($114,000). This resolution authorizes a contract with SafeHouse to provide domestic violence preventions services ($114,000), using funds accepted under DS-14. Under terms of the contract, SafeHouse Center will provide confidential support, information and referrals for victims of domestic violence cases in the 15th Judicial District Court, 14A Judicial Court and 14B Judicial District Court; monitor court and probation activity as it relates to victim safety; work collaboratively to enhance victim safety; and offer advice and training to judges, magistrates, probation and compliance officers and community partners. 12:08 a.m. Outcome: The council has voted to authorize the contract with SafeHouse. 12:08 a.m. DS-20 Accept public utilities easement. The property is located at 490 Huron Parkway owned by Johnson Building Group LLC. 12:08 a.m. Outcome: The council has voted to accept the easement. 12:08 a.m. DS-21 Accept public utilities easement. The property is located at 1500 Pauline Ave., owned by Pauline Apartments Limited Dividend Housing Association Limited Partnership. 12:08 a.m. Outcome: The council has voted to accept the public utilities easement. 12:09 a.m. DS-22 Vacate a public utilities easement. The property is located at 3100 Washtenaw Ave. (Arbor Hills Crossing). 12:09 a.m. Outcome: The council has voted to vacate the easement. 12:12 a.m. Council communications. Warpehoski says that with the Y lot resolution, there was a step towards having more money in the city’s affordable housing trust fund. He’d had conversations with some Washtenaw County commissioners about a county site on Platt Road. One of the possible uses for that county-owned property is affordable housing. He says that the city might want to be a partner with the county on the issue of affordable housing. 12:13 a.m. Briere is talking about affordable housing. 12:14 a.m. Hieftje says that in his experience the only way you get anything done on the issue of affordable housing is when you have partners. 12:14 a.m. Public commentary. There’s no requirement to sign up in advance for this slot for public commentary. 12:21 a.m. Seth Best from Camp Take Notice thanks the council for their action on the park permitting ordinance. He shares his experience as a homeless person in Ann Arbor. While the warming shelter will be opening on Nov. 18, there’s not sufficient capacity, he says. Ed Vielmetti is now addressing the council. He’d followed the meeting for a while on CTN tonight, and had come down to address the council. He asks the council to be more clear about the outcome of votes. He notes that it’s difficult to watch the meetings at local establishments like bars and laundromats without closed captioning. He gives a plug for the civic technology meetup group that he’s started. 12:25 a.m. Caleb Poirer thanks Higgins for her service. He thanks Kunselman for his efforts on affordable housing. He thanks Briere for bringing up the possibility of the city matching the DDA’s contribution to affordable housing. He regretted some of the comments of public speakers at the start of the meeting that had characterized the leadership of Ann Arbor negatively. But he was going to join those who spoke in support of their advocacy. 12:28 a.m. Farewell to Higgins. Teall leads off by saying, “Marcia, Marcia, Marcia.” She calls Higgins a great friend and a mentor. Teall tells Higgins her institutional memory has been very valuable. Hieftje has left his seat. Higgins is invited to take the seat as mayor pro tem. Taylor is now praising Higgins for her hard work. 12:29 a.m. Taylor says Higgins is good at taking care of slow, important things. 12:29 a.m. The beauty of Higgins’ being permeates the room and makes him joyful, Kunselman says. He praises her for her firmness and her longevity. 12:34 a.m. Lumm says Higgins has so many magnificent qualities. Higgins is going to blaze new trails, Lumm says. She calls Higgins a “class act.” She thanks her for her many years of service. Petersen thanks Higgins for welcoming Petersen to the council. She says she’ll miss her phone conversations with Higgins. Briere says she figures Higgins must get tired of all the praise. She recalls the time that the council used the county board room when city hall was being renovated, and Higgins had suggested that councilmembers sit next to different people. 12:38 a.m. Briere thanks Higgins for her body language. Kailasapathy says that she’d received some stares so she jokes she must not have been behaving. Anglin tells Higgins that Ann Arbor is a better town for her service. Warpehoski says he appreciates Higgins’ experience. On a lighter note, Warpehoski says he now feels less pressure to change his name to something that begins with “M” – alluding to Margie Teall, Mike Anglin, and Marcia Higgins. 12:39 a.m. Hieftje is now delivering his remarks. He thanks Higgins for her service. He reminds everyone that she’s not leaving town and that you can still have a beer with her. 12:41 a.m. Higgins is reviewing all the councilmembers she’s served with. It’s been “an amazing journey,” she says. Each and every person who’d previously sat there had helped her, so it was gratifying to hear people say that she’d helped them. She calls the current administrator the best of those she’d served with. “Thank you all,” she concludes. She gets a round of applause. 12:44 a.m. Powers is unscathed. 12:44 a.m. Adjournment. We are now adjourned. That’s all from the hard benches. Almost as good detailed reporting as when Jeff Irwin’s pen exploded at the Board of Commissioners meeting a few years ago, leaving copious amounts of ink on the credenza and his jacket. Mr. Powers actually rolled the wheel of his chair of the elevated platform where the mayor and administrator sit. Renovations of Council Chambers have been in the Capital Improvement Plan for a while, but they have not made it to a point where they have been funded. This tumble shows that the existing design has safety issues, it is also not handicap accessible. I think that was “off” the elevated platform, yes? If the Council Chambers is to be renovated, there should be a few more power outlets for the hard benches!